If you're a video gamer, chances are that you think you have heard about a snappy little gadget called the Weemote. But as the start-up that makes the product is learning the hard way, it's probably just a case of mistaken identity. 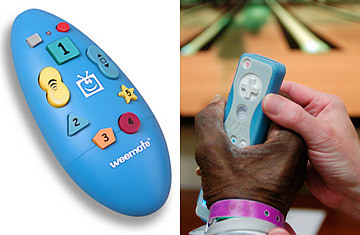 Although it is pronounced (and almost spelled) the same, the Weemote is not the same as the Wiimote, the popular nickname for the remote control used in the blockbuster Nintendo video game system the Wii, which has so far sold 28 million units worldwide. Invented by a small Miami company called Fobis Technologies, the Weemote is a nifty television remote control specially designed for little kids that lets parents limit the channels their children surf. It was trademarked in 2000, long before the Wii debuted, which means the commercial use of the Wiimote moniker technically infringes on the Weemote brand. Still, you can probably guess which of the two remote-control names is a marketing steamroller (Wiimote) and which is trying to avoid getting flattened into so many transistor chips (Weemote). Nintendo doesn't actually use the term Wiimote in its marketing, but then, it doesn't have to. The Internet takes care of that. Online retailers, from Amazon.com to used-video-game vendors operating out of their houses, advertise the "Wiimote" on their sites, openly or via more obscure means like customer product tags and posted comments. As a result, says Fobis president John Stephen, since the Wii was released in 2006, the Weemote trademark has been so "diluted" that the Weemote's sales, which are mostly online and total fewer than half a million to date, have fallen considerably. In fact, many Wiimote fans believe it's the Weemote that's guilty of the trademark infringement. "These days," says Stephen, "the little guy like us is wondering, What's the point of trademark protection?" And the not-so-little guy too. Tiffany & Co., the retail jewelry giant, is in a similar quandary after a federal court in New York City ruled on Monday that Internet companies are not required to police trademark violations that appear on their websites. The case involved the online auctioneer eBay, which Tiffany had sued after counterfeit jewelry was sold on eBay's site. The judge did say that companies like Tiffany can do the policing themselves and order websites to remove online material that flouts trademarks. But even for big firms, patrolling an ocean as vast as the Internet for intellectual-property shenanigans is daunting. For small ones like Fobis, "it's almost impossible. The research involved is very expensive," says Jean Edwards, an intellectual-property-law expert in Washington, D.C., for the Miami-based firm of Akerman Senterfitt. Rulings like the eBay verdict, Edwards adds, simply demonstrate that in the Internet age, "American small business is getting gypped." Stephen acknowledges that his problem wouldn't have been as bad a generation ago, when viral buzz didn't play as big a role in the market. But it didn't take Fobis long to realize that the viral Wiimote craze playing out on the Internet threatened to obliterate the Weemote's visibility  and that it would be hard to finger culprits in this kind of uncharted legal territory. "This is not a classic trademark-infringement situation," says Fobis' attorney, Ken Hartmann. "But the stakes still involve the time and effort and money it took to develop a product's identity." As the proverbial David in the matter, Fobis first approached the Nintendo Goliath in hopes of working out a business solution, one that would give the Redmond, Wash., corporation control of the Weemote trademark  which would seem to make sense, since Nintendo has applied to trademark the Wiimote name in Europe  while helping Fobis rebrand its product. Corporate titans like Microsoft have resolved past trademark problems in similar fashion. Nintendo has so far balked at any such deal. In an email statement, Nintendo spokesperson Charlie Scibetta told TIME, "Because Nintendo does not use and does not plan to use the Weemote trademark, we declined Fobis' offer to purchase it. We wish them success with their Weemote." Legally, of course, Nintendo isn't obliged to do anything except enjoy the free marketing ride it's getting from all the Wiimote noise. Still, many might wonder why a corporation that had more than $16 billion in sales last year won't give a mom-and-pop concern like Fobis some relief. Fobis contends that's because Amazon, like most websites, lets customers "tag" products on the site using nicknames like Wiimote. Online retailers also use software like metatags containing words and data that might be buried in the site but, when fed to search engines, can increase the likelihood that Internet search results will prominently feature that site. Even when a vendor is trying to sell a Wii remote control on a retailer's site and advertises it as a Wiimote, or if a customer posts a review of the Wii remote control and gushes, "I love the Wiimote," it's more than likely adding to the online deluge washing away the Weemote trademark. As a result, Amazon.com is among dozens of online companies receiving letters from Fobis this month asking them to erase Wiimote from their advertising, metatags and other marketing channels, overt or covert. If they refuse, Fobis may consider filing suits to make them comply. Amazon.com insists it can't be expected to monitor what it calls the postings of "third-party merchants" on its site, and the federal court's eBay ruling would seem to back up that argument. But even if the ruling says commercial sites like Amazon.com aren't required to police themselves, it does make it clear that if a trademark holder like Fobis discovers an infringement on one of those sites, it can play cybercop itself and demand that the site remove it. Still, companies like Fobis and Tiffany complain that merely having to pluck out the offending material is hardly the same as having to face punitive consequences that might deter it and other retailers from allowing that material on their sites in the first place. And as experts like Edwards note, a firm like Fobis, whose annual Weemote sales peaked at $1 million a few years ago, hardly has the resources to go suing all over the World Wide Web. All of which, Edwards argues, not only diminishes the worth of trademark protection in the Internet age, but also discourages grass-roots entrepreneurship. "Our best inventions have usually come from the little guy," says Edwards. "I see this trend dissuading them." If she's right, it would be one more example of how the Internet promises us everything except accountability. The original version of this story has been updated with a response from Nintendo.